Vodacom Group is a 22-year-old company that has always subscribed to the highest standards of social responsibility and ethics across all its operating territories. We assess our performance against various mandatory and voluntary standards. The standing commitment good corporate governance, business integrity and ethics are key ingredients to our sustainability. We are a leading African mobile communication company providing a wide range of communication services, including mobile voice, messaging, data and converged services to more than 61 million customers. From our roots in South Africa, we have grown our mobile network business to include operations in Tanzania, the DRC, Mozambique and Lesotho. Our mobile networks cover a total population of approximately 200 million people. Through Vodacom Business Africa (VBA), we also offer business managed services to enterprises in 30 countries across the continent. Vodacom is majority owned by Vodafone (65 per cent holding), one of the world’s largest communications companies by revenue. Vodacom is a listed company on the Johannesburg Stock Exchange (JSE) and manages and measures its performance with reference to the principles set out in the King report on corporate governance in South Africa 2009 (King III), the Companies Act and expectations of the FTSE Russell. The commitment to good corporate governance has been a constant feature since our listing on the JSE in 2009. The latest recognition by the Ethical Boardroom Corporate Governance Awards, the second in as many years, reflects an appreciation of governance, the central role of our board in exercising leadership and sound judgement in directing Vodacom to achieve sustainable growth and acting in the best interests of all our stakeholders. Operating responsibly is essential to our licence to operate and delivers commercial advantages to our business, helping to turn potential risks into opportunities. By acting with honesty and integrity we can secure the trust of our customers, which is integral to the long-term success of our business. We sustain our ability to create value for all our stakeholders through maintaining robust ethics, governance and risk management processes and structures. 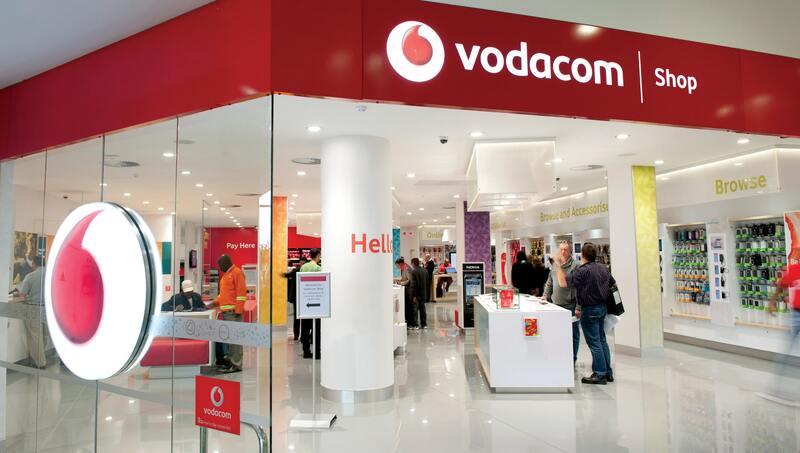 The board takes overall responsibility for Vodacom’s success. Its role is to exercise leadership and sound judgement in directing Vodacom to achieve sustainable growth and act in the best interests of all our stakeholders. Our governance structure, comprising the board, related committees and the executive committee plays an integral role in supporting our business operations and realising our purpose, vision and strategies. 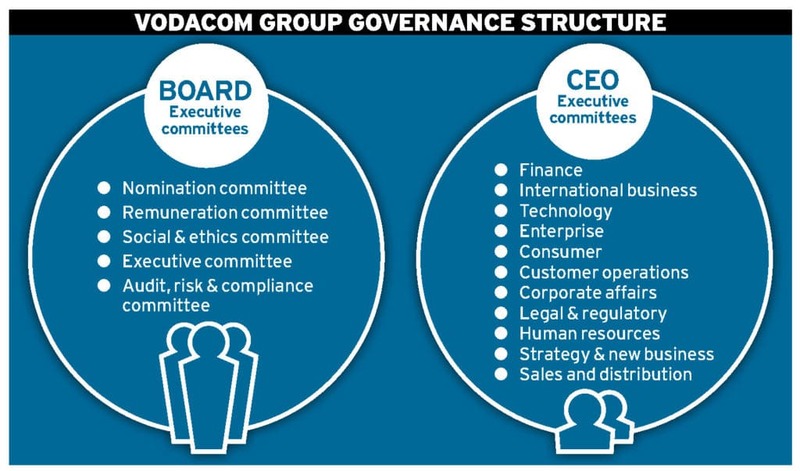 Board: Vodacom has a unitary board of 12 directors, of whom five (including the chairman) are independent non-executive directors, five are non-executive (but not independent as they represent Vodafone) and two are executive directors. Although King III recommends that more than half of non-executive directors are independent, the board is satisfied that the balance of power and objectivity on the board is sufficient and does not require additional independent voices. 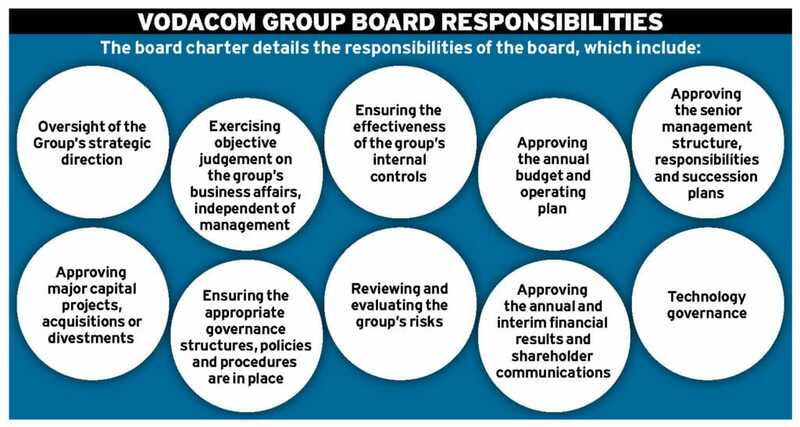 Accountability: The board takes overall responsibility for Vodacom’s success. Its role is to exercise leadership and sound judgement in directing Vodacom to achieve sustainable growth and act in the best interests of shareholders. In line with best practice, the roles of chairman and chief executive officer are separate. 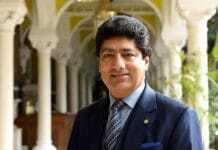 The chairman is responsible for leading the board, while the chief executive officer is responsible for the operational management of the group. The reputation of our business and value of our brand is built on Vodacom’s long-standing commitment to being a responsible, transparent and ethical business, and securing and maintaining the trust of our diverse stakeholders. The King III principles set out the ethical commitments and performance requirements that lay the foundation for a socially responsible and truly profitable business. As a Vodafone subsidiary, we have adopted the Vodafone Way, Vodafone Business Principles and the Vodafone Code of Conduct and made them relevant to our own market conditions, managing and measuring our performance accordingly. To meet our high standards, we create a culture where employees understand what we require of them, recognise their responsibility to raise concerns and have the confidence to do so. Our anti-bribery programme, supported by training and monitoring, is a particular focus. Our code of conduct (Code), supported by our 10 underlying business principles, explains what is expected of everyone working for and with Vodacom, including employees, contractors and suppliers. It also sets out Vodacom’s responsibilities to our people, partners and shareholders. The Code is underpinned by an extensive and well-established framework of policies and systems to manage our responsibilities. This year, we reviewed our Code to ensure its relevance to current business conditions and we have made the process of understanding the Code easier through videos and case studies. Valuing our customers’ trust and safeguarding their personal information. Wherever we operate, we work to ensure that we do not infringe human rights through our operations or business relationships. 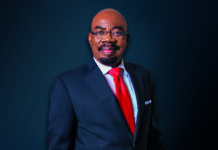 Tshepo Ramodibe is the Executive Head of Department: Corporate Affairs, Vodacom Group. He joined Vodacom in November 2010. 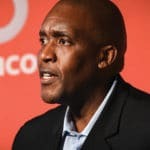 His responsibility includes building and maintaining relationships between Vodacom Group Limited and its keys stakeholders through engagements that support Vodacom Group’s strategic objectives and build a positive reputation for the company.